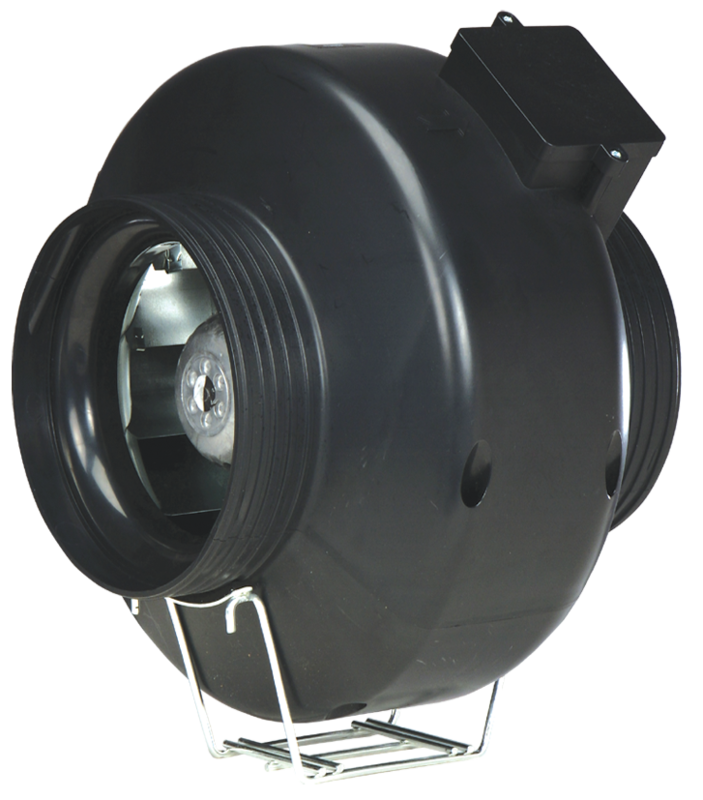 Powerflow models provide a compact yet versatile range designed with the installer in mind, combining the acoustic benefits of a tough plastic casing with the pressure characteristics of a centrifugal fan. A range of eight models from 100 to 315mm dia. duct sizes. The 300mm dia. model has been specifically developed for use with rigid ductwork. Air volumes from 0.059m³/s to 0.42m³/s at free air and capable of pressure development up to 550 Pa.
Powerflow has 50-80mm long inlet and discharge spigots allowing easy installation and fixing. The adjustable mounting foot allows the terminal box to be rotated to any angle and allows plenty of space and adjustment for screw fixing. The robust fire retardant polymeric casing combined with outlet guide vanes ensures optimum airflow management through the unit. Motors are 220-240V single phase 50Hz. Capacitor start and run. The terminal box is integral with the case moulding. All motors are fitted with Standard Thermal Overload Protection (S.T.O.P.). All models are fitted with an external rotor motor and backward curved impeller assembly for long life and reliability. All sizes are IP44 according to BS EN 60529. Ball bearings are greased for life and designed to run at any angle. Insulation is Class ‘B’ (from -30˚C to +40˚C). Manufacture is controlled to BS EN ISO 9001. Powerflow models provide a compact yet versatile range designed with the installer in mind, combining the acoustic benefits of a tough plastic casing with the pressure characteristics of a centrifugal fan. A range of eight models from 100 to 315mm dia. duct sizes. The 300mm dia. model has been specifically developed for use with rigid ductwork. Air volumes from 0.059m³/s to 0.42m³/s at free air and capable of pressure development up to 550 Pa. Powerflow has 50-80mm long inlet and discharge spigots allowing easy installation and fixing. The adjustable mounting foot allows the terminal box to be rotated to any angle and allows plenty of space and adjustment for screw fixing. The robust fire retardant polymeric casing combined with outlet guide vanes ensures optimum airflow management through the unit. Performance can be selected using an electronic controller. Surface mounting Provides infinitely variable speed control and features an On/Off/sensor slider with neon indicator. Adjustable minimum speed setting. Electrical connections for use with suitable external sensors are provided. 86 x 156 x 53mm (HxWxD). Hole for wall box: 80 x 150 x 50mm (H x W x D).